Marc Schwartz mentioned that Gorjanc Gregor has done some work years ago using R (in grid graphics). The obstacle of creating tag cloud in R, as Gorjanc wrote, lies in deciding the placement of words, and it would be much easier for other applications such as browsers to arrange the texts. That’s true – there have already been a lot of mature programs to deal with tag cloud. One of them is the wp-cumulus plugin for WordPress, which makes use of a Flash object to generate the tag cloud, and it has fantastic 3D rotation effect of the cloud. I was fortunate to get a very neat graph with no labels overlapping, but I don’t think this is a good solution, as it doesn’t take care of the initial locations of the words. My rough idea about deciding the initial locations is to sample on circles with radii proportional to the frequency, i.e. let x = freq * sin(θ) and y = freq * cos(θ) where θ ~ U(0, 2π). In this case, important words will be placed near the center of the plot. Additional columns color and hicolor will be used if they exist (hexadecimal numbers specifying RGB), e.g. Here is an example on visualizing my blog tags. The above code will generate an HTML page. You can adjust the parameters as you wish. There is still one more step to answer Tony’s original question, namely splitting the speech into single words and computing the frequency. This can be (roughly) done by strsplit(..., split = " ") and table(). Encoding problems may exist in the above code, but URLencode(tagXML) could be of help. Only Latin characters are supported, but there’s possibility to modify the Flash source file to support other languages. See Roy Tanck’s post for more information. 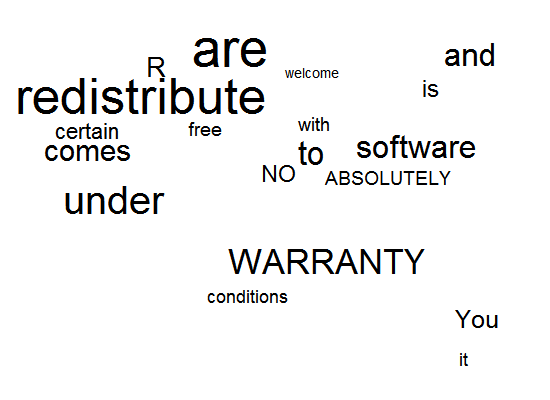 The R package snippets by Simon Urbanek: there is a function cloud() to create word cloud; words are arranged from top to bottom and left to right. See the 23rd reply below for an example (thanks, Emilio).